promoting equal rights and full justice for all. In an age when higher education for women was considered an “unnecessary waste”, Lucy worked and saved for seven years to pay her own way through college. She campaigned for woman’s rights, often before a hostile and sometimes unruly audience, usually winning at least a grudging admiration for her eloquence and her courage. Lucy died in 1893 at the age of 75. 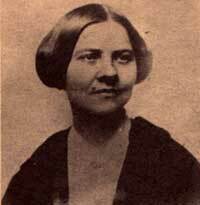 Her last public speech urging woman “to labor unceasingly” for equal rights was given six months before her death. Although the Stone Family farm house has been destroyed by fire, the Quaboag Historical Society has installed a stone marker and a large informational sign at the site. 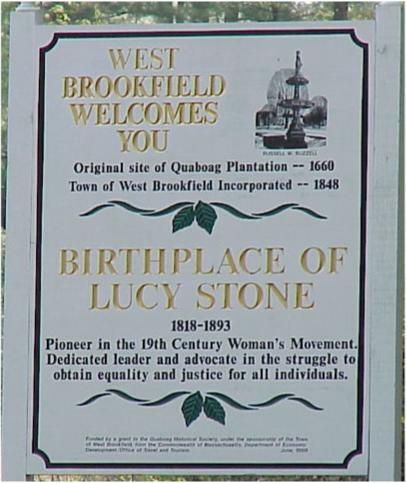 The West Brookfield Historical Commission invites you to visit it and spend a few minutes honoring this courageous 19th century woman. In 1855 – Married Henry Blackwell keeping custody of her own name. In 1869 – An organizer of the American Woman’s Suffrage Association. From West Brookfield library heading west on Route 9 it is 2.8 miles to Coy Hill Road on the left. From Ware library heading east on Route 9 it is 3.5 miles on the right. The home site is 0.3 miles up Coy Hill Road on the right.